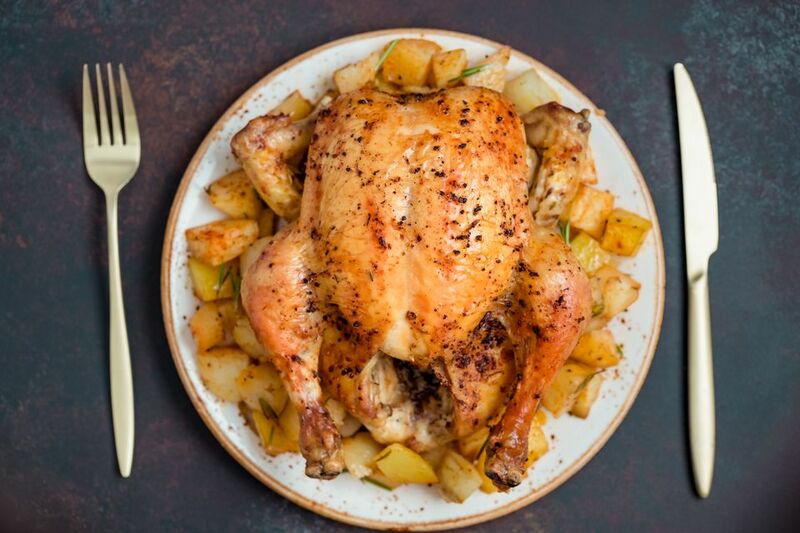 Whole roasted chicken is often saved for special occasions or holiday meals—it seems like a process to make and can take hours in the oven. Because of its small size and clever cooking method, however, this juicy and delicious chicken is a snap to cook and will be ready in less than an hour. Put a well seasoned 10-inch cast iron skillet in the oven to heat. Sprinkle the cavity of the chicken with salt and pepper. In a small bowl, combine the 1/2 teaspoon of salt, 1/4 teaspoon black pepper, onion powder, thyme, paprika, garlic powder, onion powder, and olive oil. Rub all over the chicken. Using oven mitts, carefully remove the hot skillet from the oven. Put the chicken in the skillet and return to the oven. Reduce the oven temperature to 400 F.
Roast the chicken for about 50 to 60 minutes, until an instant-read thermometer or oven probe registers at least 165 F in the thickest part of a thigh. Let the chicken stand for about 10 minutes before carving. Carve, serve with your choice of sides, and enjoy! The secret to making this chicken is using an everyday cast iron skillet that you preheat in the oven. If your whole chicken is frozen, it is best to thaw it in the refrigerator; a 4-pound bird will take about 24 hours so you need to plan ahead. If you didn't remove it from the freezer the night before, you can defrost it in a water bath, but you need to make sure the water stays nice and cold. Place the chicken (still wrapped) in the sink or large container and fill with cold water; change the water every 30 minutes. Thawing takes about 30 minutes for every pound. And although it may seem obvious, there are times this step is overlooked: don't forget to remove the package of giblets from inside the bird once your chicken is thawed. To speed up the cooking time even more, you can spatchcock (butterfly) the chicken, which simply means removing the backbone so the bird will lay flat in the pan. Cut down the cooking time by 15 minutes, checking for doneness after 30 minutes or so. If you would like to add a little more flavor and moisture to the meat, fill the cavity of the chicken with a cutup onion, lemon halves, and fresh herbs. You can also use butter instead of olive oil to create a flavored butter, then rub under the skin as well as on top of the chicken.